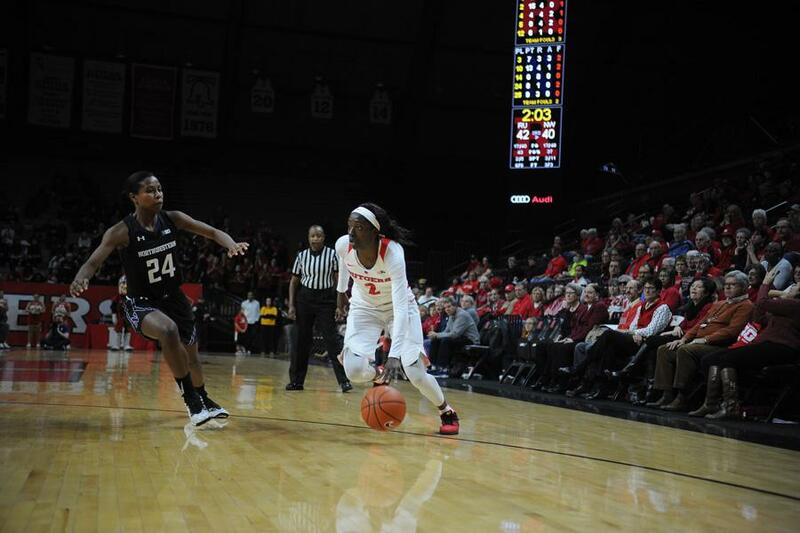 Rutgers’ Kahleah Copper attacks off the dribble. The forward combined with Rutgers guard Tyler Scaife to power the Scarlet Knights to a win down the stretch. With the game on the line, the combined play of Rutgers’ Kahleah Copper and Tyler Scaife proved to be too much for the Wildcats. Copper gathered a loose ball with less than 10 seconds to play and passed ahead to Scaife, who hit the game-winning layup and propelled Rutgers (15-10, 6-7 Big Ten) to a 61-59 win over Northwestern (14-11, 3-10) on Wednesday in Piscataway, New Jersey. The layup brought the duo’s combined point tally to 44. “Everybody ran to the ball and Rutgers got a layup at the very end,” coach Joe McKeown said of the final moment. In a game in which both teams struggled to shoot the ball, Copper, a senior forward, and Scaife, a junior guard, were inefficient in their scoring. They shot a combined 17-of-39, accounting for more than 60 percent of the Scarlet Knights’ shots. In crunch time, however, the pair shined. In just over a minute of play late in the fourth quarter, Copper scored a layup and Scaife hit a 3-pointer to tie the score after the Cats had a 5-point lead. In the final seconds, Copper dribbled to half court and passed to Scaife, who beat NU junior guard Ashley Deary down the court for the winning points with 1.9 seconds to play. Junior forward Nia Coffey and senior guard Maggie Lyon combined to score 38 points for the Cats. However, they largely disappeared in crunch time. Though Lyon hit a 3-pointer in the final minute to temporarily put NU ahead, she and Coffey were otherwise held scoreless over the last 4 minutes. Coffey missed three jumpers and had a layup blocked in that span. Despite their offense inefficiency, Copper and Scaife had an above-average night based on their body of work this year. They surpassed their combined 33.9 points per game they averaged entering Wednesday, and both scored at least 20 points in a single game for just the second time all season. The pair went a perfect 6-of-6 at the free throw line and added 10 rebounds. Coffey and Lyon, meanwhile, were just 1-of-3 at the line and totaled thirteen boards. The Cats will return to action Sunday against Maryland, who boasts its own dynamic duo in junior guard Shatori Walker-Kimbrough and junior center Brionna Jones. The two combine for 34.5 points per contest for the Terrapins. After struggling to stop one pair when it mattered most against the Scarlet Knights, McKeown said he expects his team to be ready to combat Maryland and its two stars. Correction: A previous version of this article misspelled Kahleah Copper’s last name. The Daily regrets the error.